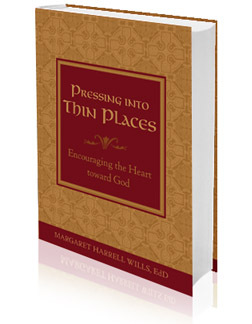 Pressing into Thin Places is a collection of stories from Dr. Margaret Harrell Wills' personal experiences, punctuated by poetry and infused with biblical verses and rich truths. Dr. Wills offers insight for bringing biblical truth to life, wisdom to cultivate a listening heart, encouragement for the downhearted, reassuring words for the faltering, and comfort and rest for those in any stage of their journey. With honest and intimate revelation, Dr. Wills explores the "thin places" where God's presence is deeply felt when the veil is momentarily lifted: the storms of life, including damaged relationships, the death of a loved one, personal confusion, and gripping sorrow. She invites you to celebrate in the struggle and ultimate triumph of faith founded in Jesus Christ, the beauty and diversity of creation, and the hope to be had in this life and the next through saving grace. A portion of the proceeds of the sales of Pressing into Thin Places will go to John Brown University Center for Relationship Enrichment. "How beautifully Margaret portrays the thin places—the tender places—the most significant places of our souls. Her work is compelling and rich with passion. It is gripping, challenging, deeply moving. The canvas she paints not only reveals a vulnerable woman, but the brilliance of a mighty Savior. Struggling to find the thin places of your life? This book is the first thing I would put in your hands."